If you’ve never been to an old school barber shop; GO. 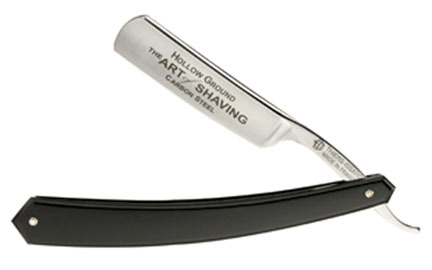 The experience will change you, and you’ll never look at shaving the same way again. While checking out my favorite blogs this morning, I came across some really great shots of New York Barber Shop. Don’t let the name deceive you though; it’s actually located in Rotterdam Netherlands. With ACQUA DI PARMA products adorning the walls, leather club chairs to kick back in while you wait, and antique fixtures finishing off the look, this shop echoes of a simpler time when men would sit around together on a Saturday afternoon talking about work, women and sports. 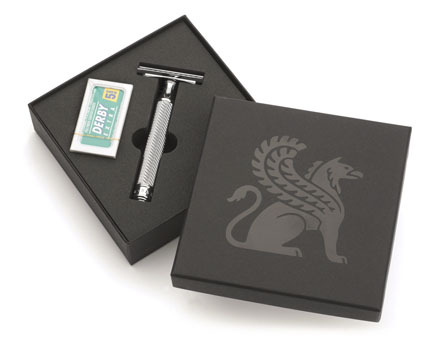 If you prefer a private shaving experience at home, you don’t have to forfeit on style. Check out these modern razors from HOMMAGE (Paris). Is the economy getting to you? You may not think so, but the stress is showing in your eyes. Here are some products to help relax, soothe and smooth tired eyes. Under Eye Complex ($18.00) fom Baxter of California is one of the best hydrating eye lotions for men. The fragrance free formula contains a blend of aloe, green tea, grape seed extract and avocado oil to minimize puffiness and dark circles. Give your eyes a buzz with the Bullie Bullet ($20), an under eye restorative that packs a punch with a triple shot of caffeine: green tea, black tea and Guarana. My favorite part is the roll-on applicator, so you won’t waste any product by applying with your fingers. A cold compress is one of the quickest ways to bring down swelling. Try the Eye Gel Mask ($13) from MenScience Androceuticals. The gel mask can be placed in the fridge (or warm water), and will retain the temperature while you sit back in your favorite recliner and let your eyes relax. Try MenScience’s Eye Rescue Formula ($37), which includes kojic acid, vitamin E and green tea to diminish dark circles and wrinkles. Last, but not least, is the Age Rescue Eye Therapy ($26) by Lab Series. The fragrance free, hydrating gel-cream formula is ophthalmologist-tested to give the user younger looking eyes. Optical diffusers reduce the appearance of visible lines and wrinkles, Pyrus Malus Extract improves elasticity and smoothness, and Fish Cartilage Extract diminishes the appearance of dark circles. On a side note, if you have questions about how a product performs, you can have a live chat with a Lab Tech.